Comments: A Marvel UK title, The Thing is Big Ben's title star was Ben Grimm, the Thing, hence the play on words to produce the somewhat clunky title; charitably, the title gave a British air to the comic by giving Ben Grimm the same nickname as the world famous bell in the Palace of Westeminster Clocktower, though more cynical commentators suggested the name was chosen as a prod at ex-Marvel UK editor in chief Dez Skinn's Big Ben character, then appearing in Warrior's Marvelman strips. 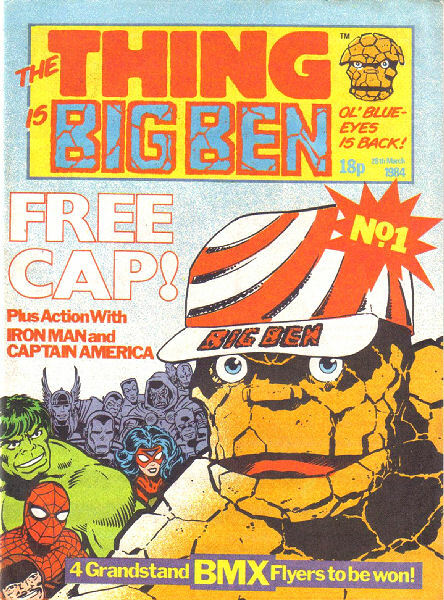 The Thing is Big Ben's main strip reprinted Marvel Two-in-One. The series cancelled after 18 issues, plus one Summer Special, with the weekly title merging into Spider-Man. For the first twelve issues Hunt Emerson supplied the non-reprint, surreal one page humour strip Donald Dogfly. Issues #14 through #18 included Tim Quinn and Dicky Howett's three panel humour Earth 33 1/3. Since that strip also appeared in other Marvel UK titles, I am unsure whether these were new or recycled.